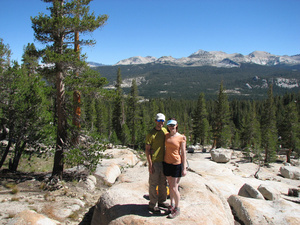 At the behest of a friend, an experienced hiker, Jonathan and I joined a group of people on a trek to Cathedral Peak. 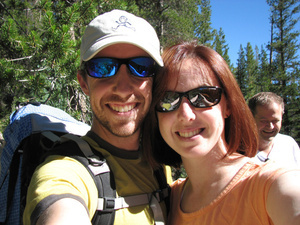 Jonathan had not been to Yosemite yet this year, a travesty in our household, so we quickly agreed to go. It would give Jon a chance to do some minor outdoor climbing. It would plunk me down in the middle of nature and allow me to clear my mind and potentially create something beautiful. "Besides," Jon said, "We did the Cathedral Lake trail two years ago, remember?" Oh, yes. I remembered the strenuous 3.5 mile hike on a steadily inclining trail. But I also recalled the pristine loveliness of Cathedral Lake. When we took that hike in 2005, Jonathan and I plopped down at the water's edge and ate a picnic lunch before napping on the warm, flat rocks. Along with a graceful, skittish doe, we'd seen many tiny frogs, butterflies and squirrels. I'd never forgotten our peaceful interlude at the lake, and even the recollection of the steep, rock hard trail didn't dissuade me from agreeing to this second trip. After all, if I'd done it once, obviously I could do it again. The thing is, we didn't actually do the Cathedral Lake trail. Exactly 165 steps from the trail head, we branched off to walk along Budd Creek, taking a shortcut to the southeastern side of the mountain. The southeastern side? I tried to wrap my brain around the geography. Wouldn't that mean that the lake itself would be on the wrong side of the ridge? Our trail wound up and up and up. Soaring pines on all sides kept us in the shade, so the morning sun couldn't quite get his ugly mits on my pale skin. We stopped every half mile for trailmix and a chance to breathe before trudging onward. Overall, our group was happy and excited about the destination. Somewhere along the way I picked up the fact that Cathedral Peak was the destination. Not the grand, towering view from its base which is what I had enjoyed two years ago from the lake, but the pinnacled peak itself, poking holes in the heavens. The thought was daunting, but I still had the practical, life-learned definition of hiking firmly set in my mind. A hike is harder than a walk; it sometimes leaves burs snagged in your socks; it sometimes leaves you with blisters on your toes; it includes a worthwhile, beautiful destination where you can relax and read or think or write (I brought writing paper!). What I didn't know and couldn't have known is that Jon's friend, the one who had invited us along on the expedition, had a completely different definition. A hike is the journey between real life and the top of the world; the end justifies the means. After three miles, our group stopped at the southeastern base of the mountain. I call it the base because from where we stood, gaping, incredulous, necks tilted all the way back, the top still appeared to be a mile or more away. And between us and the top was a vertical field of granite boulders, shrubbery, dirt and the odd pine tree. Before I could protest, we were off. The interns and our friend kept up a steady pace, taking grand strides as though the boulders were steps on a massive staircase. And to give you an idea of how steep the face of the mountain was, I soon lost sight of them, though they were only a hundred or more feet ahead of me. Jon and I inched upwards. He was breathing as heavily as I was, and carrying more equipment. I couldn't think about beauty or peace or anything other than forcing my way up to the ridge. It was slow going, navigating around and over the rocks, tripping or sliding every few steps, always hunched forward so as not to topple backwards down the mountainside. Soon, I began feeling queasy. With each step I felt heavier, thicker, dumber. Cotton clogged my ears. I couldn't think past one foot being placed in front of the other. My stomach churned. Here, I'd like to pat myself on the back for maintaining my sense of decency as long as I did. 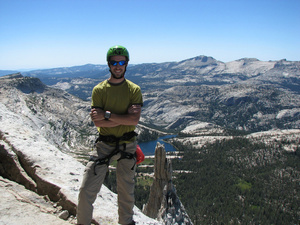 A combination of altitude, heat and fatigue culminated in my becoming violently ill less than 200 feet from the ridge. I was fortunate that I could think ahead enough to retch under a giant rock and away from my person. Poor Jonathan, also exhausted, sat by me and stroked my back and my hair and dampened a cloth for my forehead. I only remember the desperation, the terror that consumed me as I fell under the sticky, full metal jacket of altitude sickness. I'm at the top of the world, I thought, frantic. No one will be able to get to me up here. What if I can't climb down? What if they have to leave me here to get help? What if Jonathan is totally grossed out by the fact that his wife just vomited on a mountaintop? With Jonathan's help, I dragged myself the last length to the ridge, pulled myself over and was met with the staggering view. I could see the lake, though it was downright small from our vantage point. I couldn't quite make out the trail. As it turns out, the climb down was going to prove even more difficult than the one coming up. For one thing, the rocky face of the mountain on this side was just as steep as the other, but longer. Yes, longer. The red arrow shows where I collapsed and was forced to remain for two hours. 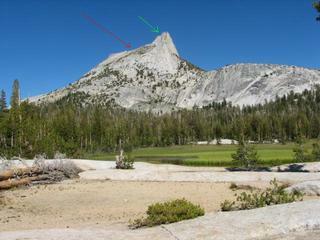 The green arrow shows where Jon helped the others climb almost to the summit (a traffic jam of climbers kept everybody in our group from actually making it the very top... 10,911 ft). Clicking on the photo will open a full-size version. I suddenly felt decidedly stuck. Wings bloomed from the back of my brain, literally unbinding from some secret pocket under my flesh and exploding from underneath my skull to spread and meet the crisp, howling mountain air. And I began to float away. Or else, I was dehydrated and had become delusional. Your call. Someone tugged me back to earth and handed me the sandwich I'd packed for lunch in the morning. It was succulent and almost holy, each bite dissolving blissfully on my tongue. Never had peanut butter tasted so good. I drank water as I was told, and the wings disappeared and my brain decided to stay on top of the mountain with the rest of me. Too weak to head for the final pinnacle to harness in and climb to the tippy top, and completely disinclined to do that anyway out of sheer indignation, I curled up in a sheltered area in the rock to read and hopefully sleep. Wind tore around the corners of the peak, whistling over fissures and crevasses, abusing the haggard, squat pines which still clung to the bare mountainside. It occurred to me more than once that Hell could quite easily be a mountaintop like Cathedral Peak, completely exposed to the worst elements of nature, in view of serenity but much too far away to seek solace in it, and every escape route visible for 360 degrees, but impossible to begin because of a lack of water and the possibility of almost certain death. That was my mood as I hunkered there. I was so thankful I'd thought to bring a book. After a while I remembered the writing paper I'd shoved into the backpack at the last minute. My intent had been to write some lazy, lovely poetry, inspired by the flat, clear water of the lake and the intricate chaos of the tiny, copper colored frogs I was hoping to see again. Alone among the granite boulders, I nurse my defeated limbs, shaking my head all the while. Disappointment is amplified by altitude. Up this near to the heavens, I am tucked between slabs of white and gray rock, stone so thick it can stop sound. But even rock isn't an equal match for the relentless gusts of wind. I can see a radius of tall, proud mountains, shoulder to shoulder along the horizon. They stand in a protective stance, teeth exposed. The peaks and ridges zipper shut the gap between us and God. But today I am a poet, one who yearns to pry back that barrier and peer forth into the realm of omniscience. It is that fact which drives me from the confines of the ordinary and the assumed, because a Poet is fated with a bloodthirst for Truth. She must track it throuh the wilderness of existence like the endangered beast it is, braving the real and the surreal and the unreal. Today I tracked Truth up a mountain, scrambling over granite scree, trudging a futile path through the sandy leavings of time, water and wind. And the Truth was my reflection in the face of beaming rock and sky. I am here, though not easily. Jon came back for me and we stood to survey our options. The rest of the group was out of our sight, somewhere to our left as we searched for the trail among the trees. "I think we're better off if we go down this way," he said, gesturing to the sheer, endless face of the mountain, boulders for what seemed like miles, straight down. I felt doomed. But I didn't argue; what could I say? And it turns out that he was right. The red path is our route down the flat, exposed face of the mountain. And yes, it is as steep and scary as it looks. Giant granite boulders, chaparral, Manzanita, ouch. My new Chaco hiking shoes were a saving grace and I escaped the "adventure" without a single blister. Our route took an hour, sometimes with us literally on our hands and knees. 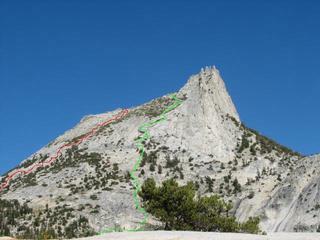 The green route represents the one the rest of our group took, thinking it would be faster. Their choice took two hours for the slowest among them and included a pause to rope in and belay down one especially dangerous section. Jonathan and I beat everyone back to the cars. I cannot overstate how hard this hike was. I've summited Half Dome three times, and that hike is more than twice the distance of this one and includes sections of giant, granite steps too big for God, thundering waterfalls that can and will soak you to the point of drowning even as you walk, thick, cumbersome steel cables which tear your flesh and will confound you with their weight and necessity. On Half Dome I have felt my mortality, but in a more constructive sense which ended with a profound feeling of accomplishment. The Cathedral Peak trail, for which I was unprepared, left me feeling almost dead and almost wanting to die. The good news is that, when Jon's usual hakuna matata mindset shattered on the granite crags and boulders, and his knees and head were aching, I snapped into some kind of delerious, self-sustaining high which kept me encouraging us and making wise cracks all the way to the trail, all the way to the cars. There are no pictures of this second half of the trip because we don't really want to remember it. Total time from trailhead to roundtrip trail end... 9 hours. Total distance covered... 7 miles. Taking a hot shower in my own bathroom at 11:00 pm, ignoring the sting of my sunburn in the spray, and losing several shades of what should have been a tan after applying soap... priceless. What did you wish, George?